I have to say that I've generally (and quite successfully) avoided reading anything by Temple Grandin until now. It's not that Temple is bad, quite the contrary, she's arguably the most influential and inspirational person on the spectrum. My reasons for avoiding her work have all been about trying to stay "spoiler free" and figure things out for myself. The first thing I have to say about this book is that it looks like an autobiography. When reviewing books, I usually don't read the back cover or anything past the title and subtitle on the front cover. I skip the table of contents and go straight to the book. This enables me to judge the book by its cover - and then by its contents. I felt that the book looked like an autobiography but I was very pleasantly surprised. This book is a collection of Temple's essays and interviews and it covers a much broader area of study that any biographical work could. The fact that the essays are grouped into categories helps too. They seem to follow a logical progression and they feel like they naturally go together. It helps that the essays are short too because this means that they stay on topic and that you, the reader, will often feel ready to start a new chapter without a break. There are 63 essays, 14 of which are new in this second edition. The average length of each essay is about five pages. They cover the broad areas of diagnosis, education, senses, non-verbal autism, behaviour, social functioning, medications, research and adult issues including employment. I don't think that I've seen another book which covers the spectrum so comprehensively. The book contains some amazing discussions including; choosing a guide dog for individuals with autism, the evaluation of medications, different styles of thinking in autism, bullying, perfection issues, the similarities between autistic and scientist brains (really) and choosing a college. Occasionally Temple's age shows through, particularly when she's discussing manners or video games but even so, many of her points are quite true and well argued. There's also a feeling of TMI (too much information) when she discusses her own health experience but again, the positive is that you know that she's holding nothing back. Even Temple's thoughts on medications are interesting. There seems to be no ulterior motivation here and Temple doesn't hold back on condemning certain medications while praising others. It's all very interesting. I was totally blown away by this book. I was amazed at how often Temple's own experience and feelings echoed my own but at the same time she opened my world to possibilities that I hadn't even considered. In one chapter for example, she talks about the problems that many people on the spectrum have with Menieres disease (tinitis). I have a major issue with ringing in my ears but I'd always assumed that it was to do with my deafness - maybe it isn't. 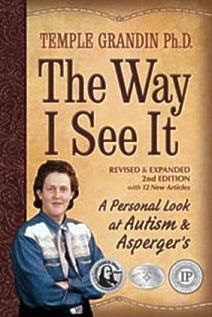 There's absolutely no reason why everyone on the spectrum shouldn't have this book. It's the best I've seen. Truly. In fact, the only reason I can think of to not read it is my own... being "spoiler free". Of course, now that I've more than scraped the surface of autism and aspergers syndrome, Temple's book has given me a whole lot of new directions to explore. "The Way I See It" (Revised and Expanded 2nd Edition) by Temple Grandin, Ph.D. is available from Future Horizons and Amazon. It's the most comprehensive book about the spectrum (from inside) that I've ever read and it covers everything from babyhood all the way through to adulthood. (My favourite bit of THE WAY I SEE IT was about bikes and cars). Wow, thanks for the comprehensive review. I liked Thinking in Pictures, and now I'll definitely have to read this. I went and ordered this book - and two others - after reading your post, Gavin. Looking forward to getting them this week in time for our vacation!